Posted on December 9, 2009 under Movies. Every once in a while, an actor is given a role, nay a chance to excel, that is so dazzling in its execution that it becomes almost immortal. In recent times, Heath Ledger did it with his portrayal of The Joker in last year’s hit “The Dark Knight” and Christopher Waltz does it this year with his portrayal of Nazi colonel Hans Landa in Inglourious Basterds. But Quentin Tarantino’s masterpiece is not just about Hans Landa, and rests on strong performances from all its cast. The story is typical Tarantino fare, but set in World War II and tells of an alternative ending to the war. It’s divided into five chapters with the first being called “Once Upon a Time in Nazi-Occupied France”, a nod to Sergio Leone’s spaghetti Westerns. It opens in typical western fashion with the Nazi’s led by Hans Landa driving in from the distance. Hans Landa is hunting for Jews and suspects that they may be hidden on a farm. What follows is a tense, suspenseful scene with Landa menacing the farmer in German, French and English!! Waltz gives a thoroughly mesmerizing performance as the Nazi colonel, with some of the best lines throughout the movie. The chapter ends with Shosanna Dreyfus (Mélanie Laurent) escaping to Paris to run a theater which later plays a focal role in the climax. In subsequent chapters we are introduced to Lt. Aldo Raine (Brad Pitt), the leader of the OSS commando squad nicknamed “The Basterds”. Dropped behind enemy lines, Raine’s squad brings terror to the Nazi hearts with their scalp taking apache ways. We also meet Oberschütze Fredrick Zoller (Daniel Brühl), a German war hero and now movie star, who is smitten by Shosanna and Sturmbannführer Dieter Hellstrom (August Diehl), a diabolically clever Gestapo Major. Other characters like the german movie star / Allied spy Bridget Von Hammersmark (for Diane Kruger) and the suave British soldier / film critic Archie Hicox (Michael Fassbender) pop up as the plot chugs towards its climax. The climax ends in typical Tarantino fashion, with violence, explosions and gunfire, a fitting ending to an absolute gem of a movie. At just under 3 hours, Inglourious Basterds is long, but thanks to the superb performances you don’t really notice it. My favorite scene is the extended showdown in the tavern between Dieter Hellstrom and Archie Hicox, Bridget and the Basterds, with the suspense hinging on something as little as an out of place accent. And I also liked Pitt’s performance as Aldo Raine and in particular his brand of “eye(I)-talian”. And last but not the least, enough praise cannot be showered on Christopher Waltz. He brings a diabolical sparkle to the proceedings, probably will get nominated for an Oscar (and maybe even win) for the role. 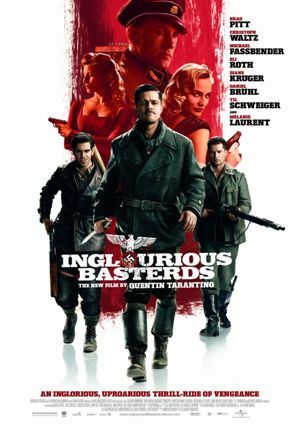 To conclude, Inglourious Basterds is brilliant, diabolic, funny, violent, brutal, human, typical Tarantino and a must watch (if you haven’t already seen it).